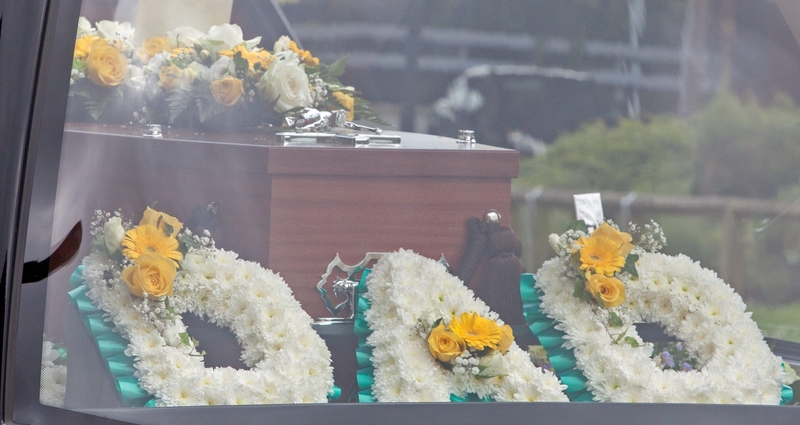 Bereaved families are facing a further rise in costs for funerals in the north and north-east – despite some fees having trebled to “astronomical” levels in recent years. Several local authorities have confirmed to The Press and Journal that they are preparing to raise the price of burials again as they struggle to balance the books. The move is being contemplated despite rising concerns in recent years that soaring costs across Scotland are pushing many grieving families into poverty. Moray Council confirmed it would be “increasing burial charges in line with the Scottish average” in its next budget, while Western Isles Council said that rises were “possible”. Aberdeenshire Council is poised to complete a 25% increase in fees over two years, while a senior Highland councillor reported that charges could rise in line with inflation. David Stewart, Labour MSP for the Highlands and islands, expressed alarm last night. “Funeral poverty is a very real issue with costs rising generally across the board,” he said. “However, burial charges are left to local authorities and across Moray, the Highlands and Islands and Argyll and Bute, costs can vary from around £500 to nearer £1,000 per burial and per cremation. A recent survey estimated that the average price of arranging a funeral in the UK has risen for 15 consecutive years and now stands at £4,271. A large proportion of the overall bill comes from the cost of burying or cremating a loved one, with additional charges relating to memorials, death and funeral notices, flowers, order sheets, car hire, a venue and catering. Burial and crematorium costs in the Highland Council area were among the lowest in Scotland a few years ago, but are now among the highest after a series of rises. The basic fee for a cremation at Inverness Crematorium has more than trebled in the last 20 years to £739, the second highest rate among Scotland’s local authority-run crematoriums, and if the chapel at the Highland capital crematorium is used for a service, the price increases to £904. Highland Council’s interment fees for cemeteries have also doubled since 2010/11 to £904. However, Aberdeenshire is the most expensive area in northern Scotland when charges for a standard burial in a cemetery are combined with the cost of purchasing the lair. The total cost for burial and grave purchase in Aberdeenshire is £1,651 – more than double the £726 charged in the Western Isles. Moray is the second highest in the north, at £1,558, followed by £1,469 in Highland, £1,467 in Argyll and Bute, £1,427 in Aberdeen City, £1,158 on Orkney and £1,062.50 on Shetland. 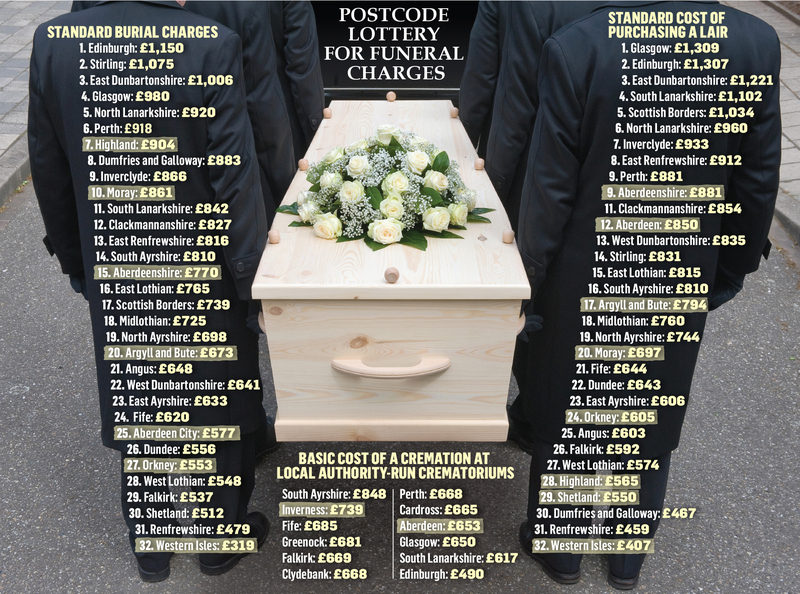 Meanwhile, Aberdeenshire and Shetland are the only authorities in northern Scotland which alter their prices depending on whether the deceased was a local resident or not. The cost of burial doubles in Aberdeenshire from £770 to £1,538 for those from outwith the area, while the cost of buying a lair increases from £881 to £1,540 for non-residents. Peterhead-based funeral director Robert Mackie branded the charges “astronomical”. “They are going up and up and up, and I think it’s scandalous,” he said. A Western Isles Council spokesman said rises were “still to be decided, though it is possible”. In 2016, Church of Scotland leaders accused Highland Council of “exploiting the grief” of bereaved families when it increased burial charges by 50%, and cremation fees by 33%. The local authority’s vice-convener Allan Henderson said councillors were keen to avoid further significant rises, but suggested they may continue to go up with inflation. Meanwhile, the basic cost of a cremation in Aberdeen has more than doubled in the last two decades, while Moray’s privately-run crematorium has hit the headlines after a study named it as one of the most expensive in the UK, at £1,128 for a full service. However, the owner of Moray’s crematorium, Dignity, said it offered a range of prices depending on the type of service, including £499 for a direct cremation, that its slot for services lasted longer than many other crematoria, and that prices had not risen since 2017. The postcode lottery on funeral charges in the north and north-east emerged after the P&J revealed yesterday that dozens of local cemeteries were close to capacity. Mike Rumbles, north-east Liberal Democrat MSP, said it seemed to be “getting more difficult and more expensive for families to hold what might be thought of as a traditional funeral in a cemetery of their choosing”. Rural residents are increasingly turning towards “direct cremations” as families struggle to cope with escalating funeral costs. The option involves a deceased person being taken directly for cremation immediately after death, with the ashes then returned to the family to arrange their own service, if they wish. Rock icon David Bowie and novelist Anita Brookner both chose direct cremations and the non-traditional method is becoming more popular in the north and north-east. Aberdeen and Inverness crematoriums both offer reduced prices if there is no service included, while the privately-run crematoriums at Buckie and Crathes cut their fees in half for cremations if no guests are invited. 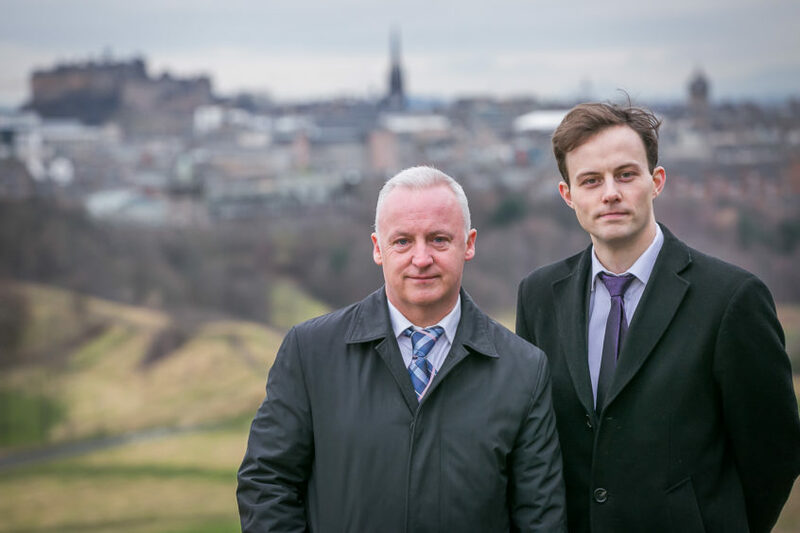 Direct cremations have also been pioneered by Scotland’s first not-for-profit funeral directors, Caledonia Cremation, which is part of the Community Renewal social enterprise and backed by the Scottish Government and European Social Fund. John Halliday, co-founder of Caledonia Cremation, said: “About 65,000 people die every year and one-in-seven fall into poverty. “It is happening absolutely all the time. Our phone is ringing off the hook at times. “Overall the industry is driving up costs and hasn’t acted in a way that recognises the issue of funeral poverty. About £4,000 to £5,000 is a normal cost. “We knew there was a problem so we decided to roll up our sleeves and do something that was more affordable and also dignified. Mr Halliday said that interest from remote and rural areas was greater than the organisation anticipated, including in Moray and Aberdeenshire. “We get as many people from the Aberdeen area as we would expect. About 10% of people are based in the north-east and the area accounts for about 10% of our funerals. “Actually we find that in slightly more rural areas, people struggle to shop around. They go onto the internet and they find us. “Rural areas are over-represented in that sense. It’s a feature we didn’t really expect. A Scottish Government minister has insisted that the nation is at the “forefront of tackling funeral poverty”. At the end of 2016, a new law came into force updating the regulation of graveyards and enabling Scottish ministers to appoint inspectors of funeral directors and of burials. A new financial assistance scheme is due to come into force this year, as well as an initiative to improve transparency on costs. 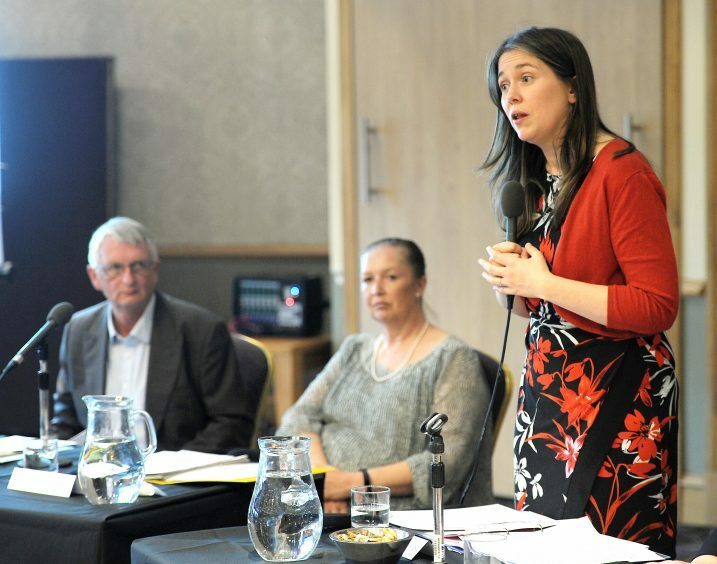 Communities Secretary Aileen Campbell said: “We are at the forefront of tackling funeral poverty, as set out in our Funeral Costs Plan, and we are working with the funeral industry, councils and the third sector to tackle this issue. “We are currently working with stakeholders to finalise guidance on funeral costs for councils and the funeral industry. “This will help improve the availability and transparency of funeral, burial and cremation costs, so people can understand, compare and choose the services that are right for them. Communities Secretary Aileen Campbell. Picture by Sandy McCook. “In addition, we will deliver Funeral Expense Assistance by summer 2019, replacing the current DWP Funeral Payment in Scotland. Meanwhile, the powerful Competition and Markets Authority (CMA) has launched a probe into the funeral sector across Britain. It is due to report later this year. In November, CMA chief executive Andrea Coscelli said: “People mourning the loss of a loved one are extremely vulnerable and at risk of being exploited.